No one is immune from silent inflammation -- a condition that occurs when the body's natural immune system goes awry -- the underlying factor behind the development of these dreaded diseases and more:• Heart Disease • Cancer • Dementia • Arthritis • DiabetesDr. Barry Sears reveals how to combat silent inflammation in order to reduce your risk of each disease and condition -- and how to reverse it if you have it already. 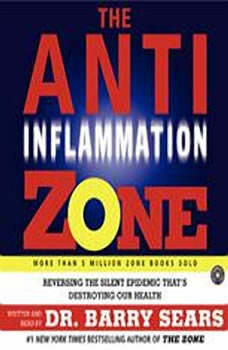 His amazing new research shows that following the Zone dietary plan, including supplements of ultra-refined fish oil concentrates, is the best way to achieve the hormonal control you need to stop silent inflammation and ensure the future of your health.Reverse silent inflammation in only 30 days -- and reap the following benefits:• Better health • Greater longevity • Improved physical performance• Reduction of the symptoms of chronic diseases • Improved emotional control • Greater mental acuityFighting silent inflammation is the number one most important thing you can do for your current health and your future wellness.